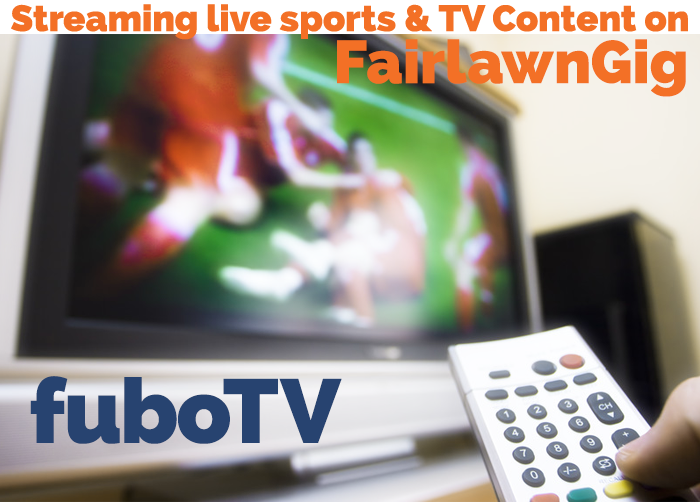 Fairlawn sports fans now have a new option to live stream their favorite games (and more TV content) on FairlawnGig®! fuboTV is the latest in the exploding TV streaming market, offering a live sports-oriented streaming service and other channels as well. Here’s how fuboTV defines itself: “…a sports-centric Internet TV streaming service with the world’s most popular live sports and entertainment content. The service offers access to national and regional networks via TVs, tablets, mobile devices, and desktop computers.” But now, fuboTV is branching out with content from AMC! AMC Networks’ AMC, BBC America, Sundance, IFC and WE tv channels will be added to their Premier package, allowing viewers to access shows like The Walking Dead, Better Call Saul and Planet Earth. In addition, AMC Premiere will be available to subscribers of fubo Premier as an add-on, while BBC World News will be made available to fuboTV subscribers as part of a forthcoming premium package. While fuboTV bills itself as primarily a live sports streaming service, it also offers other channels found on basic cable: FX, Bravo, National Geographic, MSNBC and more. fuboTV started primarily as a soccer streaming service and has expanded to many other sports, so the current omission of ESPN might change as they attempt to keep pace with their competitors: SlingTV, DirecTV Now and PlayStation Vue. fuboTV has a cloud DVR, allowing you to record games and watch them when you want for three days. FuboTV has over 59 channels. Check out their website to see their slate of channels, as it its added to frequently. fuboTV has a slate of over 59 channels with their Premier package. Currently, it’s in the beta phase, and they are offering a “limited time offer” of $34.99/month. When this expires, the cost will be $49.99, much more than the other services we have articles on here on our website. There is also a Sports Plus packaged Portuguese and Spanish packages. You can check it out with a 7-day free trial, and it’s easy to cancel without any contracts or cancellation fees. Subscriptions automatically renew each month, so if you find it’s not for you, cancel at anytime, so that it won’t renew after your current subscription period. You can stream fuboTV on most smart TVs and streaming boxes and mobile apps, allowing you to watch it anywhere. Streaming boxes include: Roku, Apple TV 4th Generation, Amazon Fire TV, Google Chromecast, and Android TV. You can also watch on computers; they recommend the Google Chrome browser for the best viewing experience. One fuboTV subscription allows you to stream from two devices at a time. Streaming on more than two devices simultaneously is restricted and prohibited due to licensing restrictions with professional sport leagues. FairlawnGig recommends the residential Premium plan or the Gigabit plan to get the best resolution, and uninterrupted viewing without buffering. 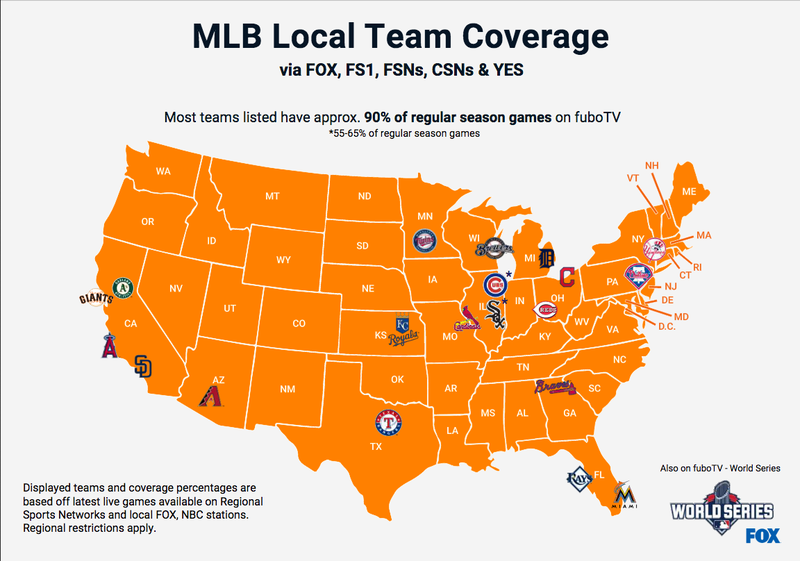 fuboTV’s website has maps of the local teams coverage you can get, and how to get them. This pdf on fuboTV’s website shows local pro teams you can stream live. A fuboTV subscription will get you SportsTime Ohio, FOX Sports Ohio, and FOX Sports Ohio Plus. Cleveland Indians fans can watch 90% of the team’s games. There are some restrictions on games. For example, if a national network is airing an exclusive broadcast, only that national network will provide that game. If a national network and regional sports network are airing the same game, there may be blackouts for the involved teams’ markets on the national network. All sports networks must comply with individual league rules that determine what is aired in your location. If you are looking for your team’s game on a national network, check your local Regional Sports Network (RSN) schedule for the local feed of the game. For example, a Cleveland Cavaliers vs. Golden State Warriors game airing on both NBA TV and each team’s RSN will be available nationwide on NBA TV except in the Cleveland and San Francisco markets. The game will be available to local fans on their respective RSNs: in Fairlawn, that is Fox Sports Ohio. You can watch it anywhere with the mobile apps. Get live sports without needing an expensive cable subscription. You can record games on their cloud DVR, which are available for three days after you record them. A quality high definition picture: better than many other live streaming services, which FairlawnGig’s speed will deliver. fuboTV is moving beyond sports with AMC content. Lacking in a big sports network: no ESPN. Cost is competitive now, with their introductory offer, but if it goes up, fubo TV will have hard time competing with other streaming services. As with all streaming services, choose the one which will fit your household’s viewing preferences best. FairlawnGig does not endorse any particular streaming service, but we have articles on many streaming services here, to help you make an informed choice. Streaming is the way TV content is being delivered and is expanding rapidly. FairlawnGig’s fast fiber network will deliver the best performance for getting your TV how you want, when you want. If you haven’t yet signed up for FairlawnGig service, please do so here.